A big culture changer at our school came during the start of our 1:1 initiative. Up until that time, administrators visited classrooms on a pretty frequent basis, and teachers were used to having an administrator in their classrooms for a short walkthrough. When our 1:1 initiative started, Holly Sutherland (another assistant principal) and I created a school hashtag, and when we visited classrooms we started taking pictures and tweeting the great things that our teachers and students were doing on a daily basis. When we started doing this, sometimes tagging the students and teachers, our teachers started INVITING us to their classrooms on a regular basis. I remember being a classroom teacher and getting nervous when an administrator walked in. Even though I knew I was doing a good job, it still made me nervous not knowing exactly why they were there. When Holly and I started visiting and tweeting, the teachers understood why we were there - to “catch them doing something right.” No longer ambivalent about our visits, we would get an email almost daily to let us know about a project, debate, discussion, presentation, etc. that would be taking place in their classrooms. 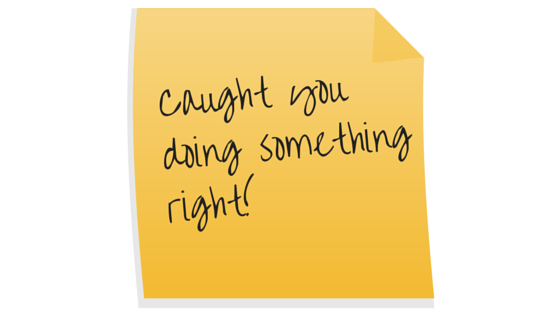 When I first became an administrator (prior to social media), I would leave a post-it note on the teacher’s desk, praising him/her on something that I had seen or heard in the classroom. I got away from the notes and started emailing the teacher instead, using my cell phone to send the quick, just-in-time emails. Now, with twitter, I simply LOVE being able to share with the WORLD the exciting things that happen within our school walls each day. As soon as he said it, I thought of the file folders I would label each year with just a heart and the year, in which I would tuck away cards, notes, newspaper clippings, etc. from the year. So this year, along with twitter. I’m going to leave a hand-written note as well as send a tweet when I visit a classroom. If I happen to not have note pads with me, I'll leave a note in their box when I return to my office. I’m looking forward to sharing with the world via twitter, but more importantly, to sharing a lasting word of praise with the teacher in the room.